A full-color brochure on RV-C is now available. 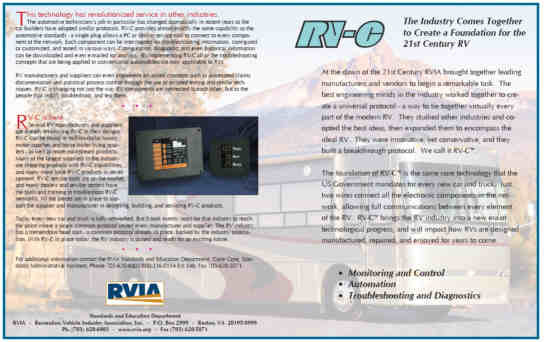 The brochure was part of the 2007 Network Fest education program, and outlines the benefits of RV-C. Written for a general audience, it is an excellent introduction to RV-C. The brochure can be downloaded here, and printed copies can be obtained by contacting SilverLeaf Electronics (541-967-8111) or e-mailing the rv-c.com administrator using the link on the right side of this page.